Friday after work I stopped off at Good Will since I was going to stop at Target to get a birthday gift for my sister (I got her a John Derian for Target 3 Piece Journal Set :) ) I ended up spending $13.99 at Good Will, I almost got some more stuff but I resisted. My spending challenge is at $95.91, so I have $54.09 with 5 days to go, looks like I'll stay nicely under my budget! That Ralph Lauren purse is so cute! I love Goodwill, don't you?! great job with your challenge. i unfortunately can't say i did ttoo well. but i know this next month will be much better! 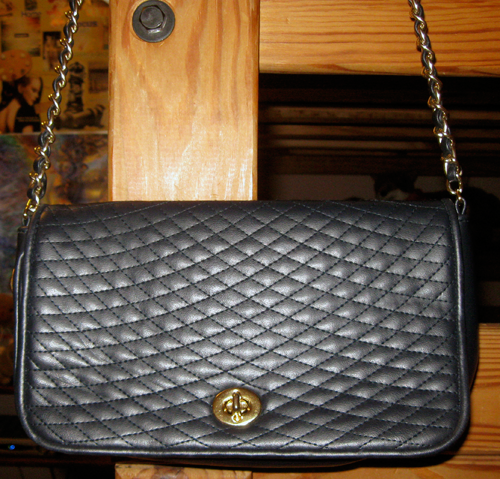 I love the purse - I need to take a Goodwill trip soon, it's been to long! I'm having a giveaway contest, check out my blog to enter. Aah I love it! :-) Oh and really great blog. I am now following. Maybe check out mine sometime..and follow back? great purse! i've been looking for one like that for ages and i haven't come across a good enough one yet. I think the sweater looks great a bit oversized. :) Happy Saturday! That purse is cute and I think the cardigan fits you just fine! You got some cute stuff! hope you to follow me back!! and thank you so much for all your beautiful comments! I have a bag like that by Bally that I found for $5 in a flea market sale in Tokyo! I wonder why they don't let the Chanel employees buy black? 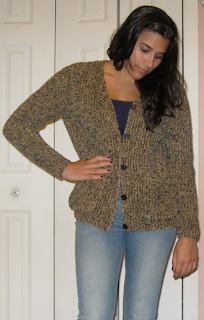 I think the cardigan has a lot of nice layering and belting potential. I can't wait to see how you style it! I'll keep my fingers crossed you are able to get your purse! And they won't let the employees have black. Wow. That's kind of shameful. your header is so pretty! nice cluth purse. Thank you! I had to do something with the shirt, beacuse only black and white I thought was a bit boring! I think a sweater that's a little big is perfect, it's nice and snuggly! love the cardigan! And your new "Chanel" bag :) I can't believe it was only $5! awesome buys! i need to hit up the thrift store ASAP. i hope you get chanel bag....so jealous. really nice purchases!!! the cardigan has nice colour and seems warmm!! That's kind of ridiculous that they don't sell black. I hate it when big expensive brands get so cheap with people. Sounds like a sweet discount otherwise though! I love the grandma sweater, but I'm super into a) grannie chic (emphasize on chic) and b) warmth! nice bag! i just made a clutch by myself, check it out on my blog and thell me what do you think! I think that the sweater will look great worn open over tighter layers such as slim fitting pants and top underneath. I don't love it with the lighter wash jeans. I would wear it with slim fitting camel or dark brown pants. I don't think that it's granny by itself but it definitely has a danger zone! 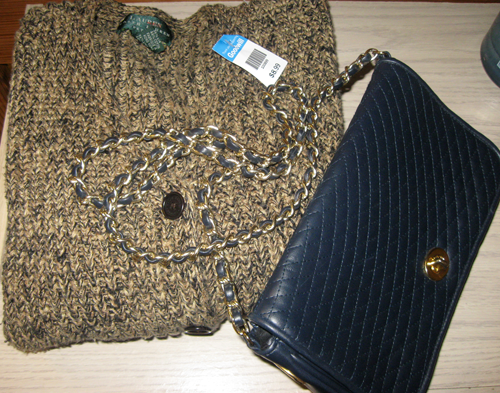 I love sweaters, chunky or light, and I love that one! what a great sweater! i love goodwill and go at least once a week... there are 4 in nearby neighborhoods and all the people there know me, haha!